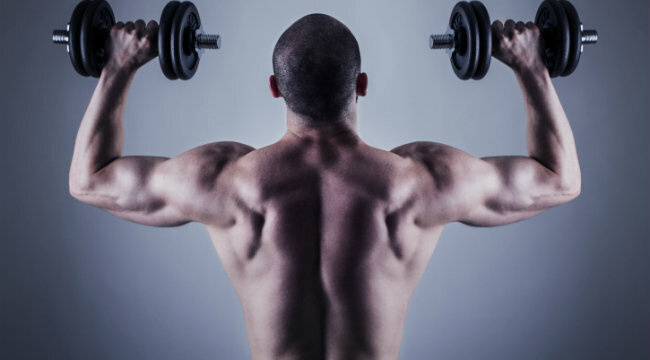 Hit the major muscles with these back blasting exercises. Just because you can't see your back in the mirror doesn't mean you shouldn't train it. A good back will give your physique a wide and powerful look, along with the illusion of having a smaller waist. But how do you build a strong V shape back? Just follow these top 3 back exercises that will hit your lat's, middle and lower back. To get into the starting position, first sit down on the machine and place your feet on the front platform or crossbar provided making sure that your knees are slightly bent and not locked. Lean over as you keep the natural alignment of your back and grab the single handle attachment with your left arm using a palms-down grip. With your arm extended pull back until your torso is at a 90-degree angle from your legs. Your back should be slightly arched and your chest should be sticking out. You should be feeling a nice stretch on your lat as you hold the bar in front of you. The right arm can be kept by the waist. This is the starting position of the exercise. Keeping the torso stationary, pull the handles back towards your torso while keeping the arms close to it as you rotate the wrist, so that by the time your hand is by your abdominals it is in a neutral position (palms facing the torso). Breathe out as you perform that movement. At that point you should be squeezing your back muscles hard.Hold that contraction for a second and slowly go back to the original position while breathing in. The reason I've selected cables instead of a single arm dumbell row is to ensure that you control the positive and negative parts of the movement. The lats are located right under the armpits and stretch down attaching to the waist. Their function is to bring the arms down and backward. As you have both arms extended in front of you - while holding the bar at the chosen grip width - bring your torso back around 30 degrees or so while creating a curvature on your lower back and sticking your chest out. This is your starting position. As you breathe out, bring the bar down until it touches your upper chest by drawing the shoulders and the upper arms down and back. Again I've selected cables and not body weight/ weighted pull ups is to ensure correct form, and to ensure that positive an negative parts of the movement are controlled. The lower traps reaches from the scapula all the way down to the lower portion of the back around the spine. Set up in a power rack with the bar on the pins. The pins should be set to the desired point; just below the knees, just above, or in the mid thigh position. Position yourself against the bar in proper deadlifting position. Your feet should be under your hips, your grip shoulder width, back arched, and hips back to engage the hamstrings. Since the weight is typically heavy, you may use a mixed grip, a hook grip, or use straps to aid in holding the weight. With your head looking forward, extend through the hips and knees, pulling the weight up and back until lockout. Be sure to pull your shoulders back as you complete the movement.